I know it’s been a few days forgive I’ve been sick and honestly I still am but I felt like I needed to get back to business. 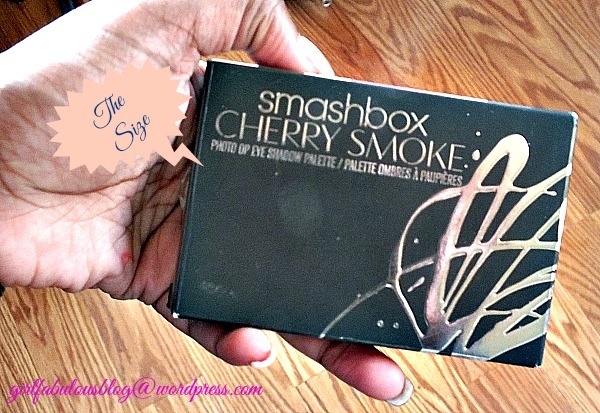 Today’s post will be on the Smashbox Cherry Smoke Eyeshadow Palette. I felt like it was very fitting for the fall season. I will admit that I was playing around with filters on these pictures so they look a little different then my normal pictures but the colors are still true. 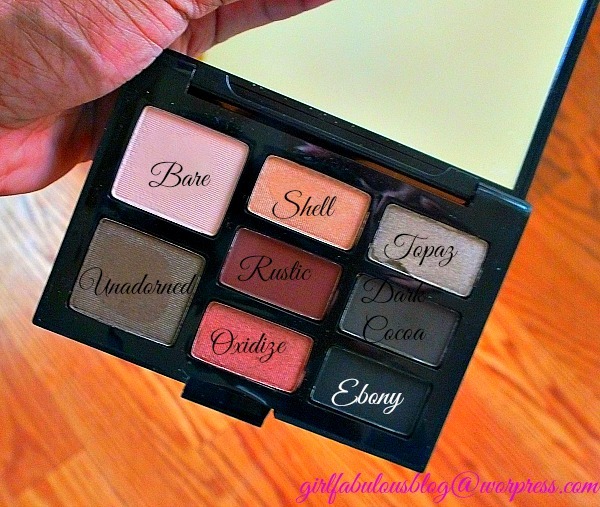 So if you are interested in my thoughts on this palette along with some pretty pictures then keep on reading!! If life is just a bowl of cherries, then shouldn’t your eyes get in on the fun? 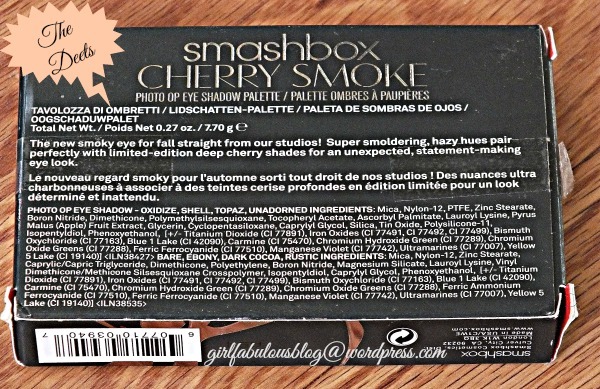 This palette pairs smoldering, hazy hues with limited-edition deep cherry shades for a photo-worthy, berry-beautiful look. Let’s start off with the box. As you can see it’s not much bigger then my hand so the palette is fairly small. I think the packing is very well done. 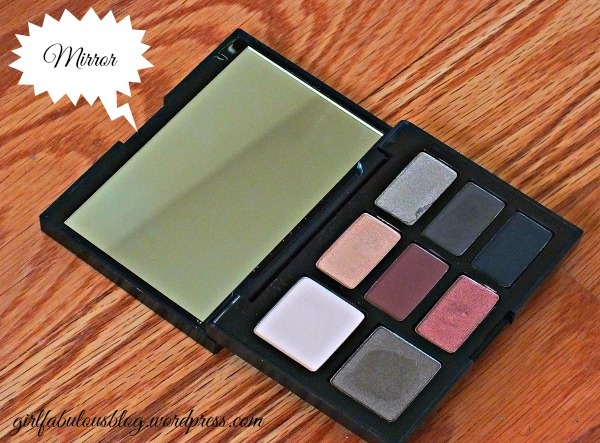 It’s not the sleekest palette but it is different. The clasp on the front flips down and the top of the palette can be lifted and you are introduced to the beautiful colors included. The detailing on the front is mirrored which gives it a classy feel in my opinion. The clasp locks in place which makes this a travel friendly product. As you can see the back has the scanner code thing. IDK what kind of phone uses those outside of Blackberry’s but I could totally be wrong. It comes with 8 colors. One of the 2 larger shades is perfect for a highlight color and I’m honestly not sure why the taupe shade is so big but that ain’t my business! There is a nicely sized mirror included which is something else perfect for traveling with this palette. I had to warm the picture a little bit in order for you to see the true colors but this is it. The shades look exactly as pictured in person as does my floors lol. 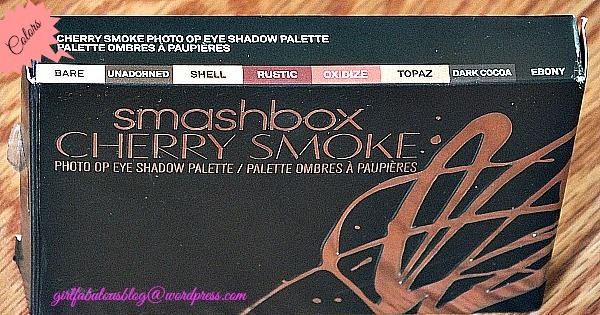 This palette retails for $39.00. Strangely I saw this palette on Sephora yesterday while window shopping and when I looked today I couldn’t find it. 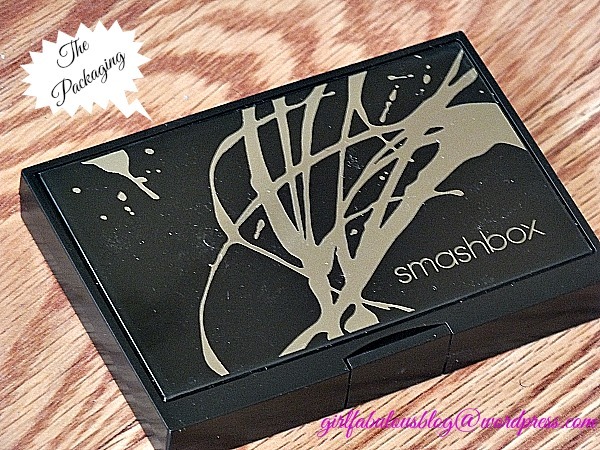 This is my first Smashbox product and I can understand why it’s high end. 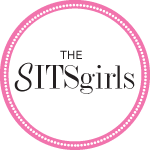 My only gripe is with the shipping from HSN where I purchased mine from. Topaz came slightly damaged but not to bad. The colors are very fall and apply very well. 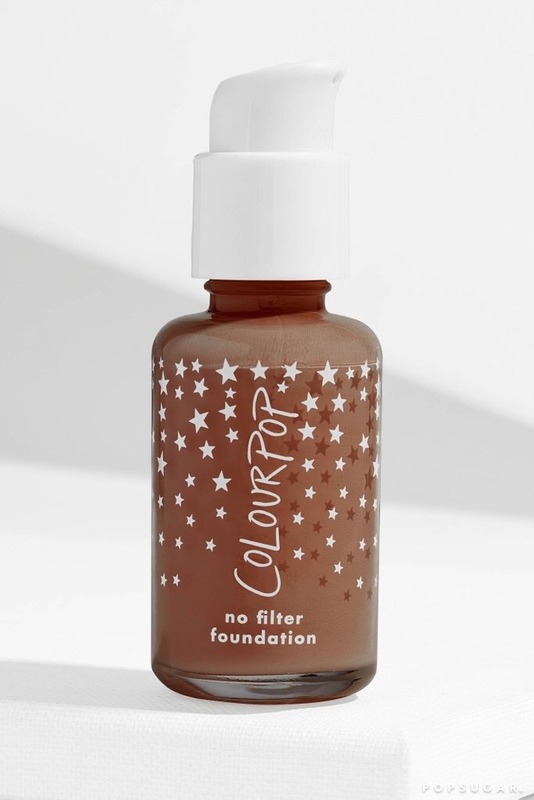 Easy to blend with good pigmentation. The look, feel and mirror size are honestly a bonus. I’m impressed. 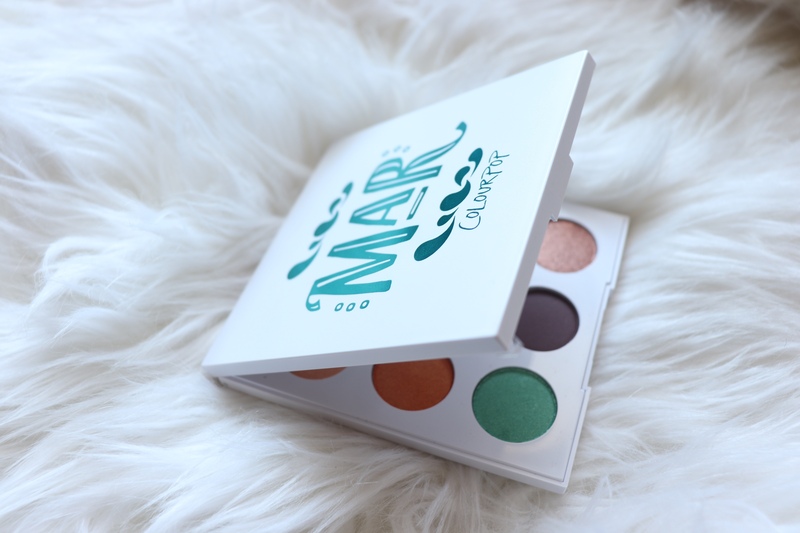 If you are interested in purchasing this palette you can get it here. For one reason or another I forgot to do swatches so they will be coming soon. 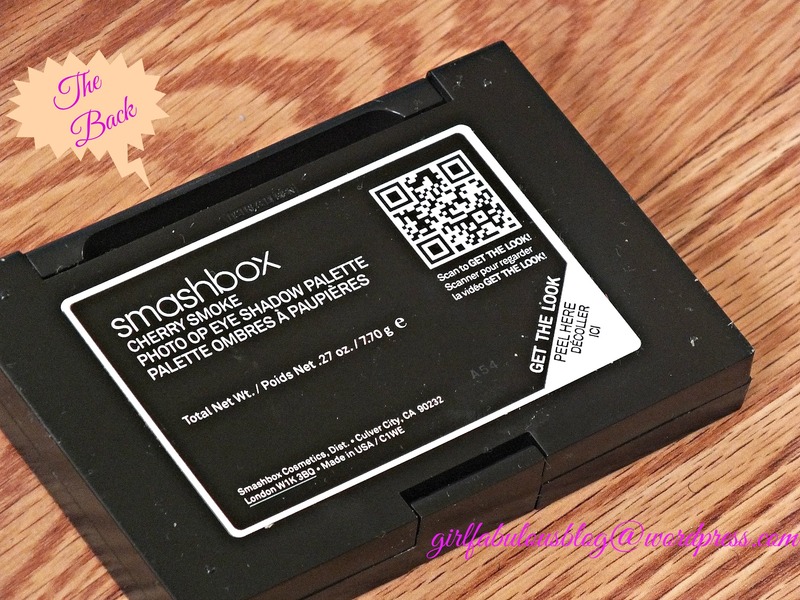 I hope you enjoyed this review and let me know if you have this product or what you love from Smashbox! Until next time BE FABULOUS!